Rotary Club of Deal - Welcome! Other events, click the link on the page for that event. Deal is a town on the Kentish, south eastern coast of England, only eight miles from the busy internationally famous port of Dover. The picture shows Deal's Timeball Tower, one of only two in the world. In bygone days the ball, triggered by an electrical signal from Greenwich was dropped at 1pm so that ships could set their clocks for accurate navigation. Uniquely, we have three castles at Walmer (the home of the Lord Warden of the Cinque Ports), Deal (only a few metres away from where we meet) and Sandown (although the latter was washed into the sea many years ago) all built by Henry VIII to defend the south east coastline against the French invaders. On the eastern side of Deal are picturesque local fishing boats, views of the Goodwin Sands and, on a clear day, the French coastline. Southwards can be seen the Walmer Lifeboat Station, the White Cliffs of Dover and the sight of ferries and the occasional cruise liner leaving and entering the famous Dover Harbour. The town of Walmer is attached to Deal and is home to the Deal Memorial Bandstand, built in memory of eleven young Royal Marines musicians murdered by the IRA in 1989. There are the children's paddling pools, crazy golf and the impressive buildings that were the former Royal Marines School of Music. Northwards are three famous golf courses, Royal St George's (where the Open was held in July 2011), the Royal Cinque Ports and Princes. In fact we are surrounded by many golf courses! In the distance the coastline of Ramsgate can be seen with ferries leaving for France and Belgium. The Rotary Club of Deal consists of thirty two lively members dedicated to the Rotary motto of "Service Above Self". We give much to charity and carry out many charitable tasks both in our local community and support many international projects. The club is always willing to consider persons for membership that conform to our principles, so if you think that you too would like to join the fellowship of Rotarians, you will find links on this site to enable you to make contact. 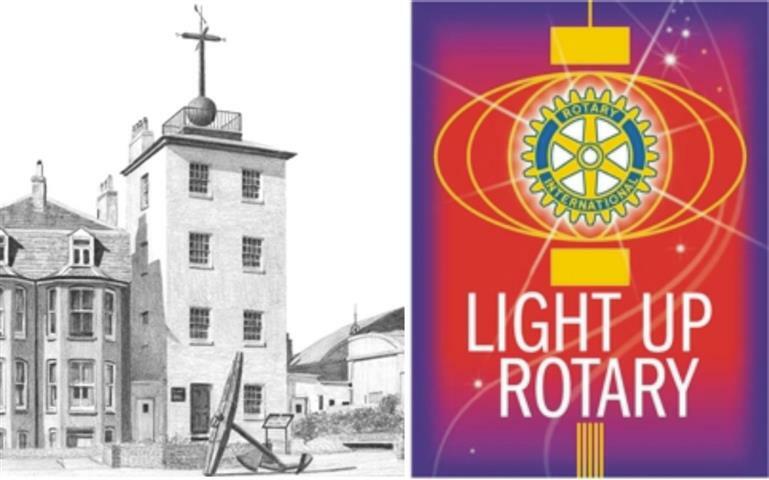 Please click here to learn about the Objects of Rotary (use your back button to return here). If you think this is something you could aspire to, then join us. Please also read The Four Way Test to ascertain if this is your belief as much as it is ours (use your back button to return here). This site will only be as good as the information supplied to the Administrator, therefore it is imperative that he be kept up-to-date with happenings within the club. Using this web site will enable Rotarians to be informed of all current events wherever they are or no matter how many meetings they have missed. Please feel free to submit a report from any committee at any time. If the committee title you require does not presently exist, it is very easy for me to create one especially for you. The better the site becomes, the more likely that outside visitors will realise that Deal Rotary Club is a vivacious club which they may desire to become part of. If there are any errors or omissions, please inform the Administrator who will do his utmost to correct such errors. Any suggestions as to its improvement will be most welcomed.